The SHU senior seminar class gathers for a group photo after the presentation with Wildlife Works representative Marsha Osborne and Napoleon, the American kestrel. Photo by L.Cowan/Setonian. 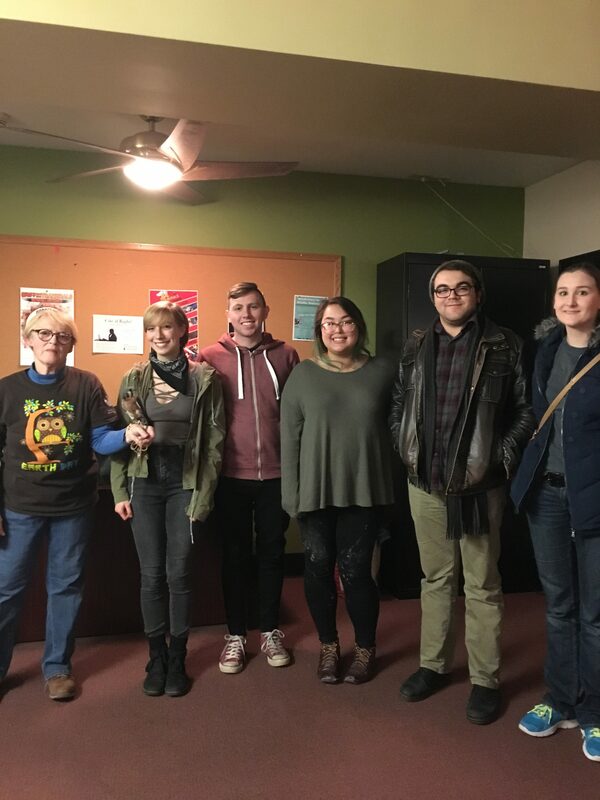 Fran Leap’s senior seminar class researched and constructed an evening event, Mindfulness for Wildlife Wellness, which took place Nov. 16. Over 20 Seton Hill University students and faculty attended the presentation and the animal demonstration and were given the answer to the question: What can you do to help? Laura Rosner, a senior fine arts major who specializes in painting, took the lead in the project and organized the guest speaker and animal handler from Wildlife Works Inc. for the social action project in their senior seminar class. “The environment is more important now than ever,” Rosner said. The class had tossed around the idea of two or three smaller projects but decided one larger group project would “have a greater impact” on the Seton Hill community. Everyone was on board for a project focused on the environment and animal wellness. Wildlife Works was able to bring in three guests to the presentation. 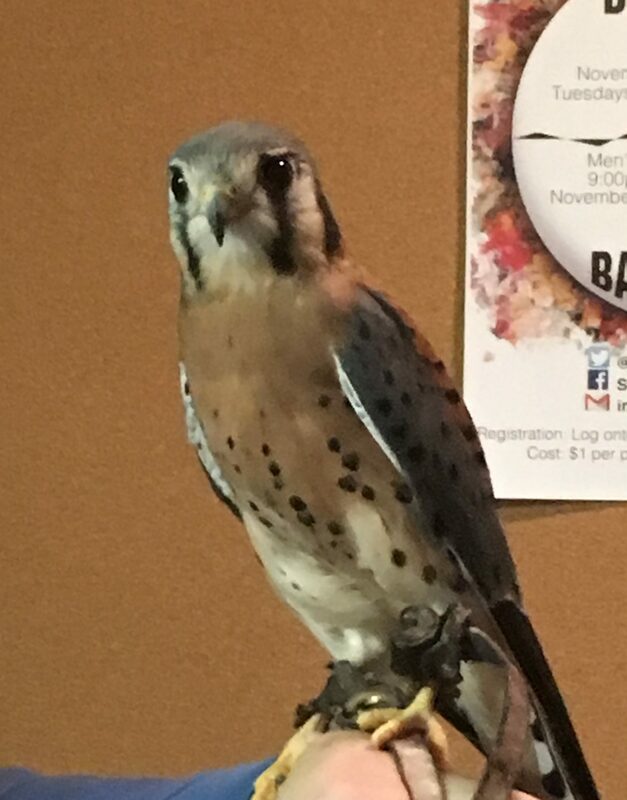 Joining the presenters of the senior seminar class was Doc, an eastern box turtle, Hunter the screech owl and Napoleon the American kestrel, who were all rescued but unable to return to the wild due to certain circumstances. Rosner, as well as Autumn Chiu, Justin Guillory, Adam Sarp and Lauren Grasser each presented a section of information on the variety of wildlife Pennsylvania holds and how to approach an animal if it is in need of help. All donations from attendees were collected for Wildlife Works, which is located in Youngwood, Pa. Contact Laura Rosner at l.rosner@setonhill.edu if interested in donating products or monetary donations. Wildlife Works Inc. can be found at www.wildlifeworksinc.org or call 724-925-6862 for more information and to volunteer. Marsha Osborne presents Napoleon the American kestrel to the crowd. Photo by L.Cowan/Setonian. Marsha Osborne holds Doc the eastern box turtle. Photo by L.Cowan/Setonian. Marsha Osborne presents Hunter the screech owl. Photo by L.Cowan/Setonian. Wildlife Works Inc. is always looking for donations. These products can be food items, rehab items or other supplies. Below is a list of items that are often needed to keep the facility running smoothly. Napoleon settles down as Marsha Osborne explains details about the American kestrel. Photo by L.Cowan/Setonian. Information researched and gathered by the Mindfulness for Wildlife Wellness presenters.